Needed…new rolls of toilet paper. Choose one member of the family to be Lazarus. Wrap that person around and around with toilet paper until the roll is gone. In the bible days, when someone died, they wrapped them in cloths and often put them in caves instead of burying them. 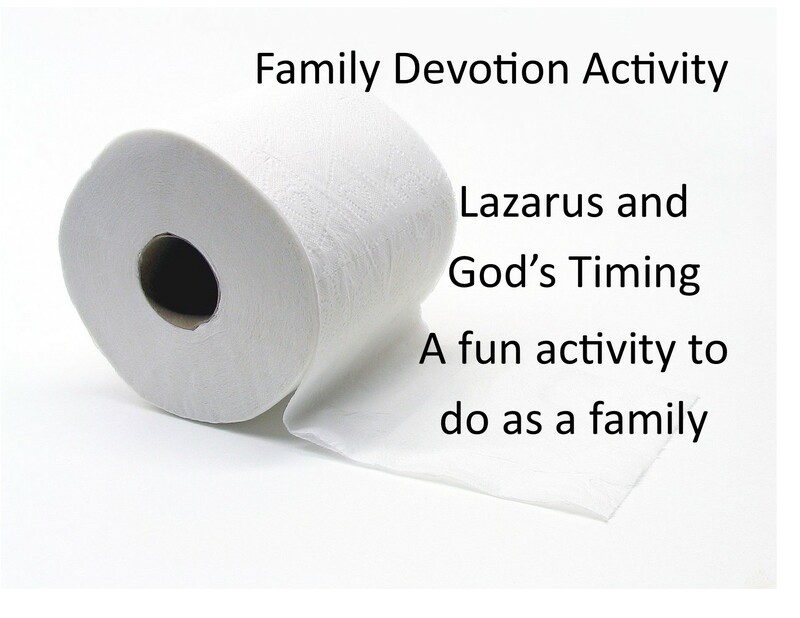 As a family you are wrapping ‘Lazarus’ in cloths. Once the family member is completely wrapped, help him or her to lay down on the couch or sit in a chair. Lazarus and Jesus were good friends. Jesus was out of town when Lazarus died. Someone was sent to ask Jesus to come back, but he needed to finish what he was doing. Between the time Jesus got the message until the time he arrived back to town, Lazarus had died. Choose someone else to be Jesus. Send him out of the room. When Jesus returns, he finds Lazarus is already dead. Everyone is sad and crying, because they miss their friend and brother Lazarus. Even Jesus was sad and cried. Then he did something no one expected. Everyone expected Jesus to come back in time to heal Lazarus so he wouldn’t die. When he didn’t make it in time, everyone thought it was too late. Then Jesus stood in front of the cave and asked that the rock be moved. Martha questioned him because Lazarus was dead for several days. Then Jesus yelled into the cave. ‘Lazarus, come forth’. That is kind of like saying ‘hey Lazarus, come on out!’. Have Jesus yell to Lazarus on the couch. The bible says that Lazarus came hopping out of the cave! He was not dead any more! Jesus had raised him from the dead. Lazarus was alive! Have Lazarus get up off the couch and hop around the room. That was a miracle. Jesus preformed lots of miracles while he was on earth. Can you name any other miracles Jesus did? Why do you think Jesus took so long to return to town when he found out Lazarus was sick? Do you think Jesus was too late? Even when we think that Jesus is not listening or not doing what we think he should, he always does what he needs to when he needs to. It he would have showed up right away he could have healed Lazarus, but that is not what he wanted to do. He wanted to raise him from the dead. That is a bigger miracle. When god doesn’t do what you think he should when you think he should, just remember Lazarus. God may have something bigger and better planned for you. The Road to Faith: Getting Our Children Started on Their Most Important Journey - Inspire Me!